The next regular membership meeting will be held on Wednesday, April 24, 2019 at 7:00 PM at the South Florida Science Center and Aquarium, 4801 Dreher Trail N, West Palm Beach, FL 33405. This month we expect to be back in the auditorium in the main building. The program for the meeting will be the showing of YouTube videos on D-Star. The club operates a 2-Meter D-Star repeater so we all need to learn more about this digital mode. Our annual Spring Picnic and Fox Hunt was held on Saturday, March 23, 2019. A good time was had by all. Thanks to Richard Smith KM4RYM and Jerry Grant KI4NUV for running the picnic and to Bob Hagans for running the Foxhunt. On September 26, 2018, we had a special event as the meeting program. We had a very successful ham radio equipment auction and all area hams were invited to buy or sell their ham radio related equipment. Over 50 people attended and there were more than 75 pieces of equipment that went up for auction. On August 18, 2018 the WPBARG held a 'Build Your Own Antenna' Workshop. Attendees built their own tape measure Yagi antenna for use in Fox Hunts or just for normal operating. The programs at recent meetings have been excellent. * February-Jim Nagle KF4OD presented "The Softer Side of SDR"
* January-Marc Wiskoff W2MBW conducted a special show for us at the Science Center Planetarium. * November-Rex Rathbun AJ4GC presented "Moon Bounce (EME)"
* October-Steve Ikler KS3K presented "Ham Radio Digital Modes with Emphasis on FT8"
* August-Dr. Ron Goldstein KJ4UUG presented "Disaster Survival Skills"
* July-A viewing of a video by Bob Allphin K4UEE about the aborted Bouvet Island DXpedition earlier this year. * February-“Vertical Antennas” via Skype by Tim Duffy K3LR. Tim is the COO and GM of DX Engineering and a noted contester. Tim has one of the biggest contest super-stations in the US and it’s located in northwest Pennsylvania. On April 6, 2019 the club held its regularly scheduled Volunteer Examiner (VE) test session at the Science Center. We had two candidates taking tests. One upgraded to Amateur Extra and one achieved their Tech class license. Thanks to our Volunteer Examiner Team, Bob Hagans, Team Leader (W4SOG) and Steve Werner, Asst. Team Leader (KD3WK). The next VE test session will be on Saturday, June 1, 2019 at 10:30 AM at the South Florida Science Center and Aquarium, Discovery III building. Please contact Jerry Grant KI4NUV at ki4nuv "at" yahoo "dot" com to reserve a spot for the test. In 2016, the South Florida Science Center and Aquarium (SFSC&A) submitted a proposal to the "Amateur Radio on the International Space Station" (ARISS) program to host a radio contact with the crew on-board the International Space Station (ISS). The proposal included the West Palm Beach Amateur Radio Group as its partner to provide technical assistance. In a December 15, 2016 press release, the program announced that their proposal was selected to "move forward into the Next Stage of the ARISS Selection". Only 11 schools/organizations qualified for the second half of 2017. A successful contact with the space station was held on November 6, 2017. Local students were given the chance of a lifetime to talk live with an astronaut in space. During the radio contact, eleven young students talked with Italian astronaut/ham Paolo Nespoli and asked questions they had prepared. The students, ranging in age from 7 to 12, were selected after writing an essay on what one question they would like to ask an astronaut. There was only a nine minute window where the ISS was in range for a radio contact. The ISS travels about 17,600 miles per hour and is over 250 miles above earth. Members of the WPBARG were actively involved in the event. 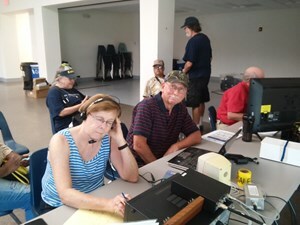 The lead technical person was Jim Nagle KF4OD and he was assisted by Rex Rathbun AJ4GC. Jim initiated the contact by calling, "NA1SS this is WS4FSC." NA1SS is the callsign of the ISS and WS4SFC is the callsign for the club's radio station. After a couple calls, the ISS replied and the contact began. Jim then handed the microphone over to the first student for him to ask his question. After receiving the answer from the astronaut, the next students followed with their questions. Things went so smoothly that some students had time to ask a second question. 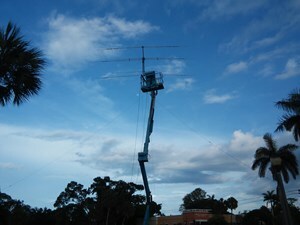 The WPBARG was previously given the opportunity to conduct a radio contact with the ISS at the Science Center in 2012. Amateur Radio on the International Space Station (ARISS) is a cooperative venture of the Radio Amateur Satellite Corporation (AMSAT), the American Radio Relay League (ARRL) and the National Aeronautics and Space Administration (NASA) in the United States, and other international space agencies and international amateur radio organizations around the world. The primary goal of ARISS is to promote exploration of science, technology, engineering, and mathematics (STEM) topics by organizing scheduled contacts via amateur radio between crew members aboard the ISS and students in classrooms or informal education venues. With the help of experienced amateur radio volunteers from amateur radio clubs and coordination from the ARISS team, the ISS crew members speak directly with large group audiences in a variety of public forums such as school assemblies, science centers and museums, Scout camporees, jamborees and space camps, where students, teachers, parents, and communities learn about space, space technologies and Amateur Radio. Jim Nagle, KF4OD, being interviewed by media. The West Palm Beach Amateur Radio Group was founded on July 12, 1939 which means that we celebrate our 80th Anniversary this year. We plan to have several events during the year to celebrate the occasion. Our new Anniversary Logo is at the top of this column. We are working with our shirt vendor to have special shirts with the logo available for purchase. We will have a Special Operating Event On-The-Air from July 5, 2019 until July 19, 2019 using the callsign W4P. Special QSL cards will be sent to those who contact us and send an SASE. Watch the Home Page for more events when they become known. • Food – Purchased, cooked and served by Richard Smith KM4RYM and Kevin Addison KM4RYN – Kevin kept everyone hydrated with bottled water. GREAT JOB GUYS!! !